Temperatures reached an all-time high of 69 degrees Fahrenheit in Des Moines on Monday. Iowa Mesonet found that temperatures at 8 AM and 12 PM on Monday also reached an all-time hourly high for the state on the 131 year record. A cold front swept across the state Monday night, causing temperature highs to drop to 40 degrees Fahrenheit in Des Moines on Tuesday. There are a couple of months left in 2017, but the year is expected to be the second or third warmest year on record. The World Meteorological Organization announced on November 3rd at the United Nations climate change conference that average temperatures from January through September 2017 were 1.98 degrees Fahrenheit higher than preindustrial levels. In fact, the five year period from 2013 through 2017 is expected to be the warmest five year period on WMO’s record. Temperatures in December and January will determine whether 2017 is the second or third warmest year on record. The first game in the 2017 World Series, a match between the LA Dodgers and the Houston Astros, was held in California for the first time in 15 years—and brought with it a record-shattering 103 degrees. The previous World Series heat spike, 94 degrees, was recorded in 2001 in an Arizona game between the Arizona Diamondbacks and the New York Yankees. A heat warning for the area extended well into the game and finally lifted around 8pm—or about three hours after the game commenced. The LA Dodgers, who won the game 3 to 1, might have owed something to the heat. High heat has been proven to have an effect on the distance a ball travels across the field. The University of Nevada-Reno’s Department of Math & Science put together a chart spanning analyzing the average number of home runs per game and the average distance of a batted ball, taking the temperatures of each game into account. After sifting through data from World Series games played between 2000-2011, they found that when the heat of a game spiked beyond 75 (the determined average temperature for an MLB game), home runs for any given team increased by an average of 2, while batted ball distance increased by roughly 2ft, suggesting that heat has a tangible effect on offensive play. The heat spike spells bad news for other California residents, however, as the increased temperatures and accompanying 50 mph winds have made the ongoing wildfires in the Northern half of the state dangerously powerful. While the LA Dodgers beat the heat and made California proud, the state’s battle with wildfires will likely not ease up anytime soon. By now it’s common knowledge that as greenhouse gases continue to accumulate in our atmosphere, intensely high temperatures are likely to occur more frequently. But Climate Central, a climate research and news organization, has developed a way for residents of the continental U.S. to see exactly how much their communities will be affected. The interactive tool allows users to type in the name of their city or town and view the average number of days that will exceed specific temperature thresholds in 2050, 2075 and 2100. The analysis includes data for nearly 30,000 cities and towns of various sizes from across the continental U.S. Each graph provides two possible outcomes: one in which greenhouse gas emissions continue as usual and one in which they are moderately curtailed. Researchers based their projections on aggregated data from 21 global climate models. At present, Des Moines experiences an average of zero days per year when the actual temperature is above 100 degrees Fahrenheit. According to this study, the city will likely see 15 days annually that exceed the temperature threshold in 2050 and up to 30 per year in 2100. This year is on track to be the hottest year ever, followed by 2016, 2015, and 2014, respectively. This week’s On The Radio segment describes how climate change will have a disproportionate economic impact on urban areas. Transcript: A recent study by an international group of economists found that climate change will likely cost cities twice as much as rural areas. 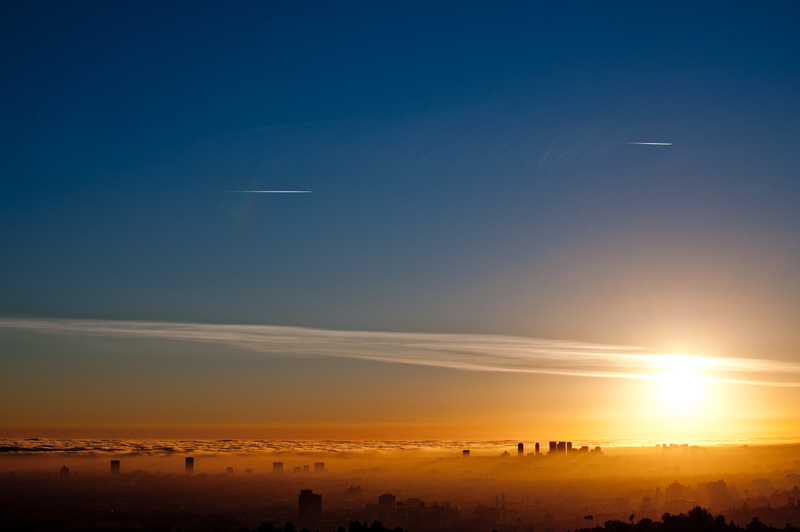 The study, published in the journal Nature Climate Change, found that the largest quarter of the world’s cities could see more intense temperature spikes by 2050 due to the combined effect of global warming and urban heat island effects. Urban heat islands are formed when naturally cooling surfaces like vegetation and bodies of water are replaced by surfaces that trap heat like concrete and asphalt. Higher temperatures in cities have negative economic impacts including less productive workers, higher cooling costs for buildings and poorer water and air quality. On average, the global gross domestic product (GDP) is expected to drop by 5.6 percent by 2100 due to climate change. The combined climate change and heat island effect means that the most-impacted cities are expected to lose about 11 percent of their GDP in the same period. The economists noted that some actions can be taken to mitigate these effects including installing cooling pavements and green roofs and reintroducing vegetation in urban areas. To read the full story and for more information, visit iowa-environmental-focus-dot-org. The body of scientific research examining the extent to which extreme weather can be attributed to human-induced climate change is growing. Carbon Brief, a climate journalism site out of the United Kingdom, recently created an interactive map that color-codes these studies, making it easy to discern which events were caused by climate change and which were not. Carbon Brief mapped a total of 144 extreme weather events worldwide that have been included in “extreme event attribution” studies. 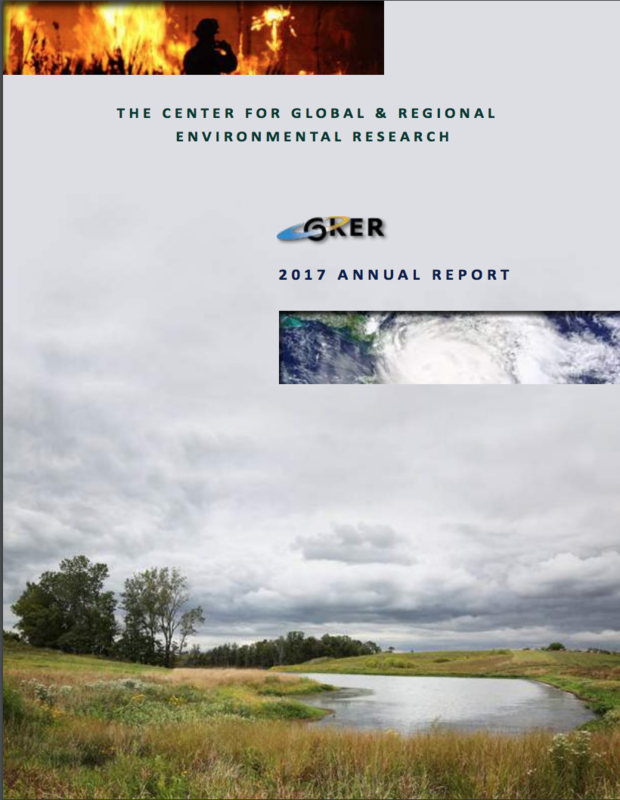 The investigators determined that 63 percent of all extreme weather events studied thus far “were made more likely or more severe” by human-induced climate change. Extreme heat waves account for almost half of those events that can be attributed to human-induced global warming. In 14 percent of the studies, scientists determined that humans had no discernible impact on the likelihood or severity of the weather event. For five percent of the weather events studied, climate change made the event less likely or less intense. The vast majority of these occurrences included cold, snow and ice events. Perhaps the most striking finding included in the report is the overwhelming effect climate change has on the intensity and severity of heat waves. The investigators looked at 48 heat wave attribution studies and determined that 85 percent of those events were made more severe or more likely thanks to global warming. Fewer than ten extreme weather attribution studies have been published so far in 2017. Carbon Brief plans to continue adding updating its map and providing analysis for new studies as they are published in peer-reviewed articles. The Medical Society Consortium on Climate and Health released a report on Wednesday explaining the ways in which climate change harms the physical and mental health of people in the U.S. The report, titled “Medical Alert! Climate Change is Impacting our Health” was written by medical doctors, including allergists, pediatricians, infectious-disease doctors, OB/GYNs and gerontologists from eleven health organizations. Very few Americans, less than 32 percent, can name a specific way in which climate change harms human health. “Doctors in every part of our country see that climate change is making Americans sicker,” said Dr. Mona Sarfaty, the director of the new consortium. The authors broke down the specific health effects of climate change in each region of the U.S. The doctors explain that three by-products of climate change will directly impact human health: air pollution, extreme heat and extreme weather events. Increased temperatures associated with climate change intensify smog, wildfires and pollen production, leading to poor air quality, the report said. “Poor air quality increases asthma and allergy attacks, and can lead to other illnesses, hospitalizations, and deaths,” the authors wrote. The physicians pointed out that extreme weather events are also taking a toll on their patients. The increased frequency and severity of major storms, floods, and droughts can cause injury, displacement and death, the report read. These events often prevent residents from receiving proper medical care due to blocked roads, destroyed bridges and the like. Gastrointestinal illness and disease often follow the power outages associated with extreme weather events as well, according to the doctors. Beyond these direct impacts, climate change also speeds up the spread of infectious diseases and has an insidious impact on humans’ mental health. With temperatures rising around the world, infectious disease vectors like ticks, mosquitoes and fleas can now survive in regions that were previously too cold for them. For example, “Ticks that carry Lyme disease have become more numerous in many areas and have expanded their range northward and westward,” the report said. U.S. residents that have experienced increasingly common extreme weather events like foods, major storms, and droughts are likely to suffer mental health consequences including post-traumatic stress disorder (PTSD), depression, and anxiety. Anyone could experience these effects, but women, pregnant women, the elderly, children, and those with a preexisting mental health condition are most at risk. A University of Wisconsin study has found that the number of extremely hot days in midwestern and eastern U.S. cities is expected to triple by mid-century. The study – which was published this week in the Journal of the American Medical Association – predicts Milwaukee and New York City will see three times their current average of days that reach 90 degrees of higher by 2050. It also examined the ripple effects that hotter days and the resulting increase of storms would cause on public health. These effects include increased risk for waterborne and other infectious diseases as well as health risks associated with greater air pollution and a more carbon-intensive diet. To combat these adverse effects on public health, the study suggests a number of measures including: reducing fossil fuel consumption, designing sustainable cities, and eating less meat. The study drew on experts from the studies of public health, air quality, and climate science. The study cited the 1995 Chicago heat wave which led to more than 700 deaths. Since 1982, extreme heat in Wisconsin has killed more people than all other natural disaster combined. Extreme heat throughout the country has also killed thousands of cattle and other livestock in recent years. 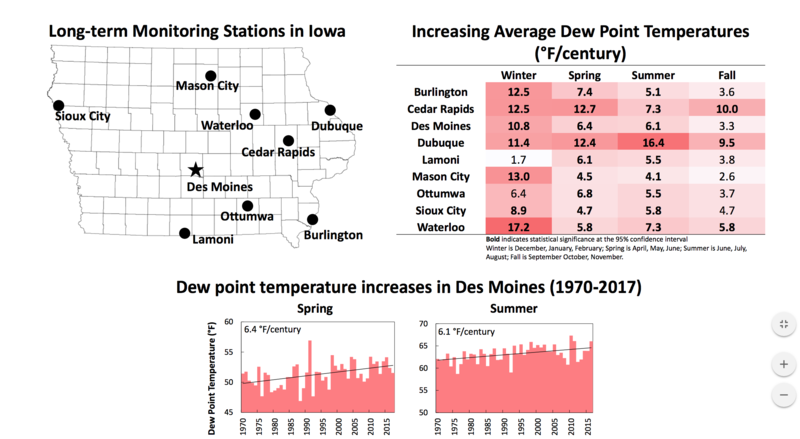 Statistics about heat-related fatalities in Iowa were unavailable, however by 2100 Des Moines is estimated to have 85 days with temperatures of 90 degrees or higher and 30 days of 100 degrees or higher.